Terminally ill toddler Alfie Evans has been granted Italian citizenship, the Italian foreign office has said. The High Court ruled in February Alder Hey Children's Hospital could stop providing life support for Alfie against the wishes of his parents Tom Evans and Kate James. The parents have since lost a series of legal challenges to the decision. The Italian Ministry of Foreign Affairs said it hopes Alfie will be allowed "immediate transfer to Italy". Posting on Facebook, Mr Evans said: "Alfie has been granted Italian citizenship. We await for the [Italian] foreign minister to call Boris Johnson." He then said outside the Liverpool hospital: "I'm stood here now and Alfie is still here. Why? Because I'm still fighting for him, I'm still fighting and so is Alfie." Mr Evans said he had been in touch with the ambassador of Italy and his son had been given Italian citizenship, which he claimed would block any planned withdrawal of life support. 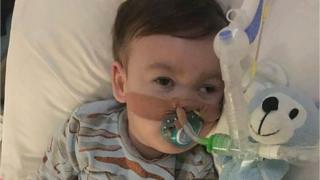 The Christian Legal Centre, which represents Alfie's parents, said: "The Italian ambassador has urgently contacted the court with a request for the Italian government to be allowed to intervene in the case and seek the return of their citizen Alfie Evans to Italy." Mr Justice Hayden who ruled doctors could stop treating Alfie against the wishes of his parents has overseen a further hearing this evening. A spokeswoman indicated the judge had heard submissions from lawyers in private via a telephone link. Pope Francis renewed his support for the family earlier by tweeting: "Moved by the prayers and immense solidarity shown little Alfie Evans, I renew my appeal that the suffering of his parents may be heard and that their desire to seek new forms of treatment may be granted." 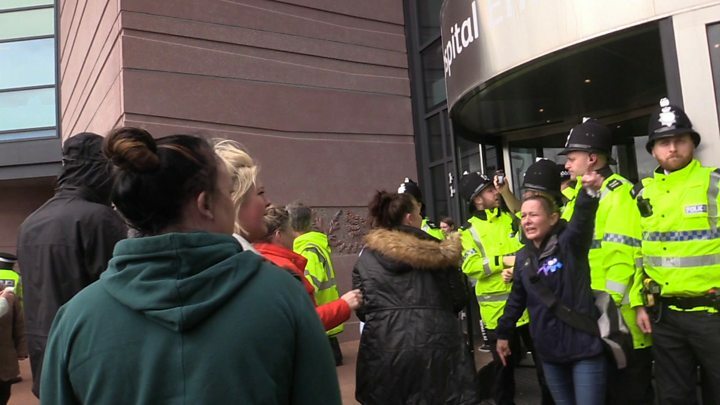 Before Alfie was granted Italian citizenship, a group of protesters supporting him tried to storm Alder Hey hospital before police officers formed a line to block the entrance. About 200 people turned up to protest outside the hospital after judges at the European Court of Human Rights (ECHR) refused to intervene in the case. Alfie has been in Alder Hey since December 2016 with a rare undiagnosed degenerative neurological condition. The hospital has argued that keeping him on a ventilator is not in "his best interests" and any further treatment was not only "futile" but also "unkind and inhumane". But his parents want to take him to Rome's Bambino Gesu Paediatric Hospital, which has links to the Vatican, where his palliative care would continue. Alfie's parents had lodged an urgent application with the ECHR over the 23-month-old's life support. However, an ECHR spokesman said the family's application was "inadmissible". Before today's ECHR ruling, Alfie's parents had already lost a first round of cases in the High Court, Court of Appeal and European Court of Human Rights, as well as two cases at the Supreme Court. Earlier this month Mr Evans flew to Rome to meet Pope Francis and begged him to "save our son". The Pope previously tweeted his support for Alfie, saying he hoped the "deep suffering" of the toddler's parents would be heard. The Foreign Office has been contacted by the BBC but is yet to comment.